Last week I had the privilege of attending the International Consortium for Law and Religion Studies (ICLARS) conference held on the campus of The College of William and Mary and on the campus of the University of Virginia. 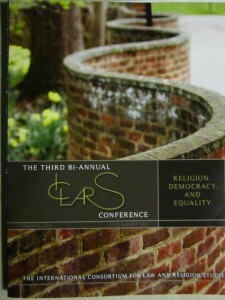 Legal scholars from around the world gathered to present papers on their research, and to network. 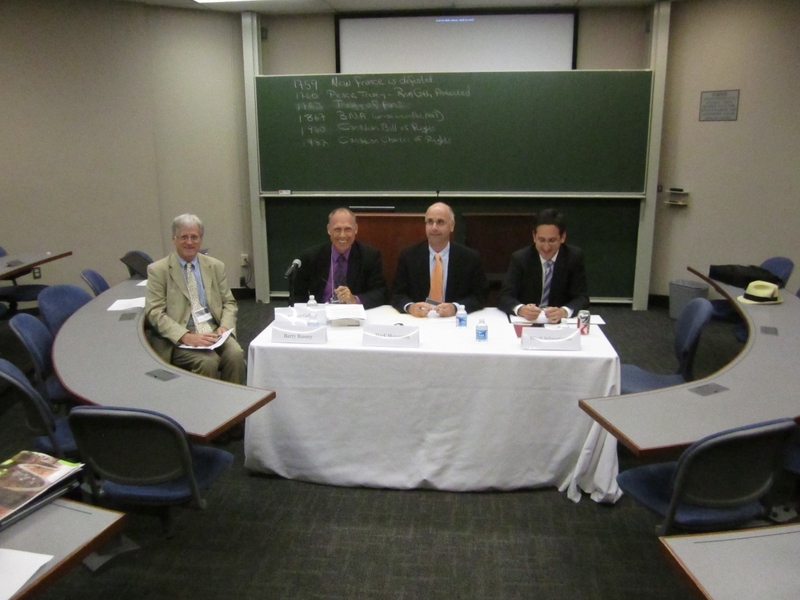 On Friday afternoon (August 23, 2013) I presented on a panel, “Is Religion Special?”, moderated by Edward Gaffney of Valparaiso University Law School. The panel also included Micah Schwartzman of the University of Virginia Law School and Mark L. Movsesian of the St. John’s University’s Center for Law and Religion. I outlined my investigation of Canadian jurisprudence for why the law protects religion. There is very little that answers the question. Up until the arrival of the Charter, in 1982, the courts were fixated with trying to determine if religion (in the law) was a federal or provincial jurisdiction. Since the Charter, the court has reviewed the history of religious freedom in the modern age and determined that religion is protected because that is what an “enlightened” society does. The court’s rationale is that religion is personal, the Charter does not want to prescribe a definition of the good life. The “enlightened” society allows every person to find their own way as long as he does not interfere with another’s rights. (John S. Mill “harm principle”) The high water mark appears to be the Gruenke decision where two justices made a strong case for the benefits religion gives to society, i.e. stability, the assisting of individuals to find their way in life, etc. Since Gruenke, the cases have been fixated with equality rights — this has led to a diminution of the protection of religion in favour of other “competing rights” by use of the “proportional” analysis. My conclusion is that the Canadian law has a void — it lacks a rationale for the protection of religion. Such a rationale must ultimately be developed to properly address the modern context while appreciating the past. Mark L. Movesian shared his current work on the “nones” – those who claim no religious affiliation and how that affects religious freedom law in the U.S.. He made reference to the “Psychic Sophie” case, wherein the court held that “following one’s inner flow” is not religion meriting constitutional protection. Mark’s presentation was very well organized and clearly presented the confused state of American law on the subject. It would be well for the judiciary to heed Mark’s work and put order to the jurisprudence. I am of the opinion those who claim no religious affiliation must also have their deeply held beliefs respected in law. Micah Schwartzman presented his recent thinking on “Religion as a Legal Proxy.” The thought is that while religion may not merit special protection, an argument he has written on previously, religion could be a proxy for all the goods that do. In other words, “religion” becomes a label of sorts. However, he recognizes that perhaps religion may be so loaded a term that another might be more appropriate such as “conscience.” Micah has a very precise paper that is certainly worth further investigation. Since he has argued religion is not special he is by this concept of “religion as proxy” putting into play the idea that religion may still be useful. Personally, I do not see how religion as a proxy can work. First, I disagree with the underlying premise that religion is not special, for reasons that I will continue to explore in this blog; second, to treat religion as a proxy is itself an admission, it seems to me, that religion must have some special character — for why else would you seek cover under its umbrella? Third, what do we mean by religion? Such a concept is bound to get bogged down in semantics if we were to use it as a proxy. Finally, I think Micah is correct to be leery of the usefulness of religion as a proxy.